Yesterday I wanted to try a new recipe for the large head of cauliflower I had in the refrigerator. I stumbled upon this Cauliflower and Herbed Barley Salad from Bon Appétit. It sounded fantastic and had rave reviews so I gave it a try. The recipe is very easy to make, and it’s substantial enough to make a fine vegetarian main course. (You could make it vegan with vegan mayonnaise.) It can be served warm or at room temperature. It holds up well, so it would be perfect for a picnic or potluck. Leftovers make a great lunch the following day. I chose to serve it as a side dish with quickly roasted Copper River Sockeye Salmon. The dinner was a hit at Chez Dedon! 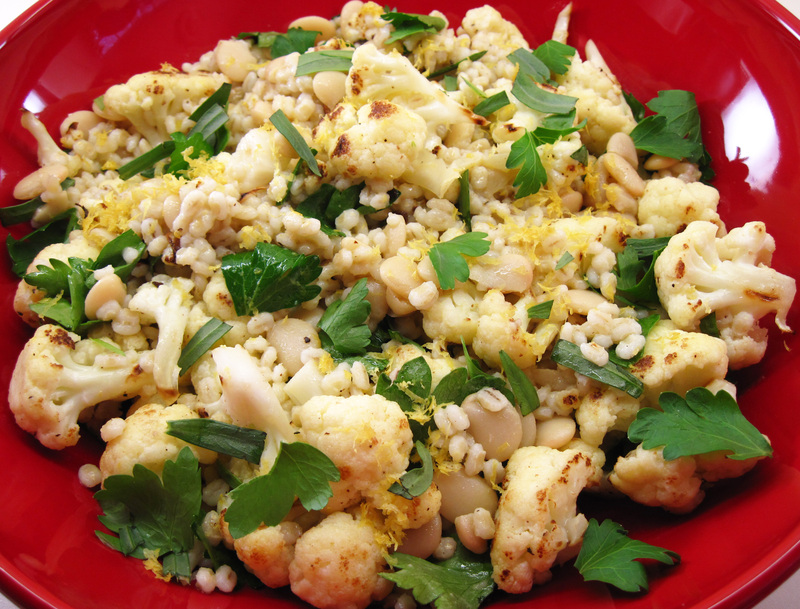 I would definitely make Cauliflower and Herbed Barley Salad again. I might add a clove of garlic to the dressing next time. Garlic is always a good idea! I couldn’t find gigante beans, so I used butter beans which were very good. 1. Put the barley in a large pot and add enough water so it’s covered by about 2 inches. Stir in about a teaspoon of salt. Cover and bring to a boil. Reduce heat so it’s gently boiling for about 25 – 30 minutes, or until it’s tender. Drain, rinse under cold water. Set aside in the strainer. 2. Whisk together the lemon juice, mayonnaise, mustard, and 5 tablespoons of the olive oil. Season to taste with salt and pepper. 3. Heat 1 tablespoon of olive oil in a large skillet. Add the cauliflower and cook, stirring occasionally, for about 10 minutes. The cauliflower will start to have a few browned spots. 4. Add 2 tablespoons of water to the pan. Cover and cook for about 2 minutes more. Season to taste with salt and pepper. 5. Put the cauliflower in a large bowl. Stir in the beans, barley, ¼ cup parsley, and 2 tablespoons of the tarragon. Toss with the dressing. Garnish with the grated lemon peel and additional parsley and tarragon leaves. And since I have fresh parsley and tarragon…I clearly have to try this! 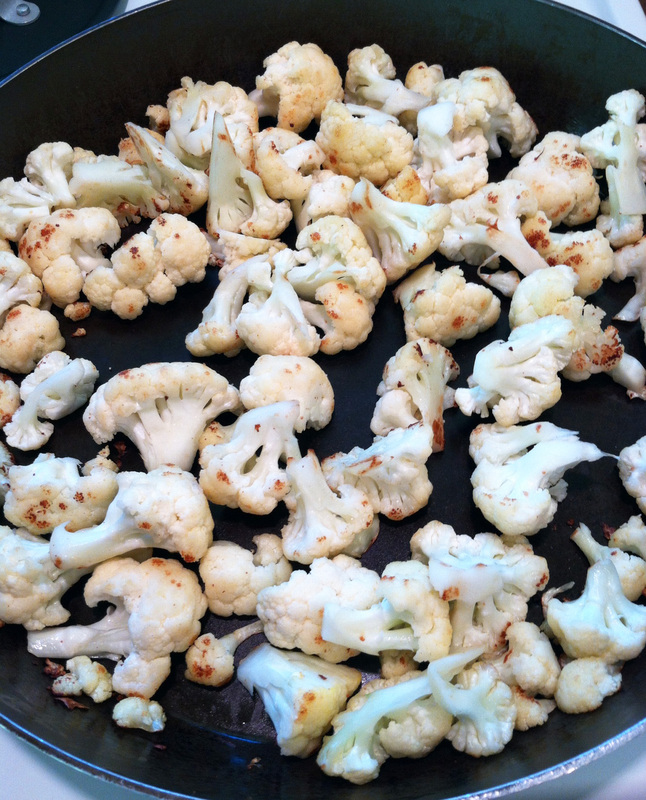 We love cauliflower and are always looking for new recipes to try. Consider this page bookmarked! I can’t wait to make this…hopefully after Lucy is born!